I am pretty sure I will perish if I don't find a way to one day own this Christopher Kane jacket! 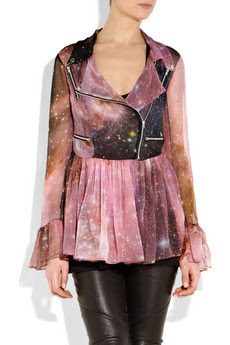 Love the galaxy print juxtaposed with the biker jacket shape juxtaposed with the silk chiffon! That's a triple juxtapose people!! Buy at Net-A-Porter for... wah $2,575.